Meet our March Featured Teacher, John Trimble! Mr. Trimble is the Science/STEM Teacher at Franklin School in Corvallis, OR. 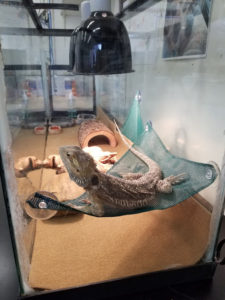 His classroom pet, Groot the Bearded Dragon, has helped him improve his classroom climate! 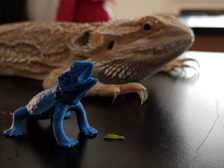 Why did you decide to get a bearded dragon? Talking to kids about him and watching kids smile when they hold him. Think about food costs over the long run. A bearded dragon will eat >$4,000 worth of crickets during his lifetime if you buy them at the store. Do you have any tips on caring for your classroom pet? Let kids do the hard work! How has Groot impacted your students? The introduction of a pet into my classroom transformed my relationship with a number of students. Last year, I used a Pets in the Classroom grant to obtain Groot. We measure his mass and length weekly to chart his growth. Students have drawn pictures of Groot, sculpted him out of clay, include his image in class projects, and even write short stories about him. One student used digital media software and a laser etcher to create a portrait of Groot on a piece of wood. They even photoshopped his face onto the 8th grade class poster! One of my gifted students is working on a 3D printed replica of Groot. Students who previously did not like Science class suddenly had a reason to come in and be excited about being in my room. Students brought in photos of their own pets and created a “pet wall” behind Groot’s terrarium so all our furry friends can be with us in the classroom. They feed him and love him!